Right now would be a great time in the US for overseas travel. With the stimulus package coming to fruition in Congress, Our US dollar is at the height of value, and the value of other currency is less than the US dollar because of the myopic view that our economy although bad, is less bad than other economy's. New Zealand, for instance is a 2-fer. One US dollar buys +/- .55 of goods and services in the Kiwi state. The weather? 60's and 70's. Perfect for golf as there is plenty of daylight to search for lost golf balls. 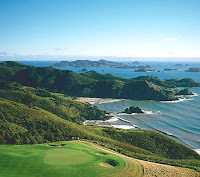 Browse my sponsor Ultimate Kiwi Sports Tours to view unreal photographs of absolutely breath-taking golf courses, and book your Kiwi adventure! When the economy gives you lemons...make lemonade...Kiwi-style.